Leading up to the Midterm elections, many analysts and political experts referred to 2018 as the “Year of the Women.” This proved to be true not only in Congress, but also in many state legislatures as women were elected in record-setting numbers across the country. Georgia was no exception. In fact, Georgia’s WIN List celebrated the highest number of endorsed women elected in the 2018 election cycle than ever seen in during our almost two-decade-long history. The 12 WIN List endorsed women who won in 2018 helped bring the percentage of Georgia women legislators to a historic high of 30.9 percent. This surpasses the national average for women in state legislatures as well as the percentage of women currently serving in Congress. Of the 73 women serving in the 2019 state legislature, 56 are Democratic women. This means Democratic women now outnumber GOP women by approximately 3.3 to one. 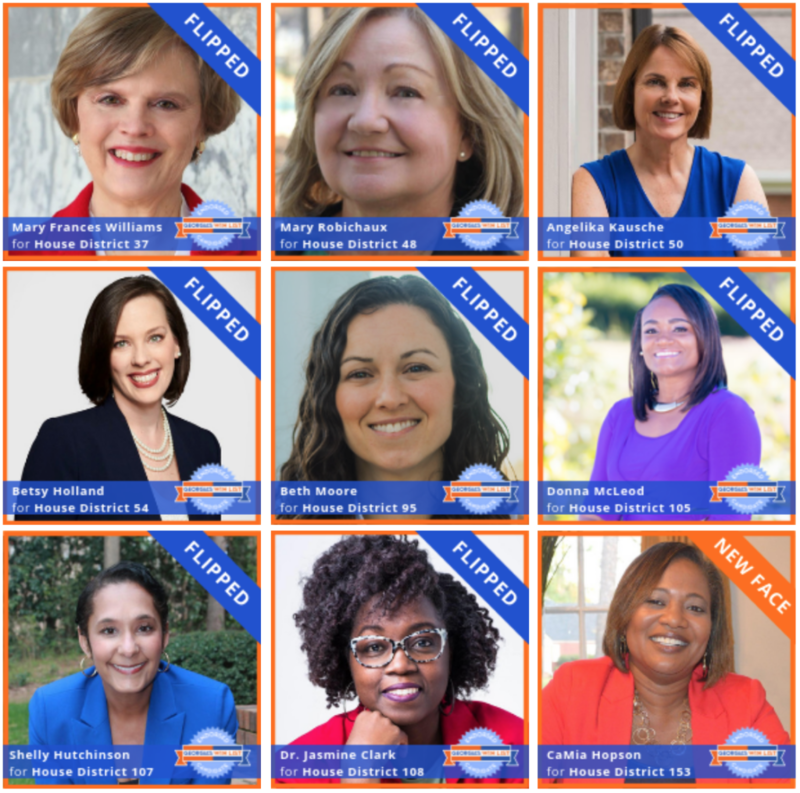 The election of these 12 WINning women helped flip the legislative delegations in THREE Metro Atlanta counties from GOP to Democratic control: Fulton, Gwinnett, and Cobb! DeKalb County is now 100% represented by Democratic candidates thanks to the election of Sally Harrell to SD40. According to the Center for American Women in Politics, Georgia ranks 20th in the nation for the percentage of women in the state legislature for the 2019 legislative session. Having ranked 23rd in the nation during 2018, our 12 WINning women (plus more) helped Georgia move up three spots in the national rankings. Georgia has also long lead the nation for the highest number of Black women serving in any state legislative body nationwide. Those numbers also remain to be calculated for the 2019 legislative session. Georgia continues to lead ALL of the southern states with the percentage of women serving in the state legislature. Two women have qualified for a February 12th Special Election to replace a sitting GOP legislator for HD 176 who was appointed to the Public Service Commission. Both women have been sent our endorsement application. Recruitment for the 2019-2020 WIN Leadership Academy class is already underway. Find the application and more information HERE. A recently completed “Best Practices” study has been distributed to our newly-elected WINning women to help them more effectively represent their constituents. Recruiting efforts for 2019 municipal elections and the 2020 legislative election cycle are already underway. Curriculum development for one-day campaign training “Boot Camps” to be offered throughout the state this Spring is underway. Your contribution to Georgia’s WIN List is an investment in all the women leaders we help recruit and train. By investing in our women, you are also investing in the future of Georgia. Train rising women stars in our communities to run for office or help other women who are candidates. Train endorsed candidates in the best strategies for WINning their races. Help our WINning women maximize their impact as they serve in the legislature and follow best practices to protect their seats. Provide financial support for our endorsed candidates with contribution checks and independent expenditures made on their behalf. Provide technical and fundraising support as well as voter outreach and volunteer recruitment for endorsed candidates. Strengthen the WIN List Sisterhood. Join us with your donation today!